Heading into the home stretch, the Poutine Challenge brought me to an ol' favourite in La Brasserie. However, things have changed since my last visit in 2009. First, it closed suddenly in 2014 only to be re-opened with new owners and some of the former staff in 2015. 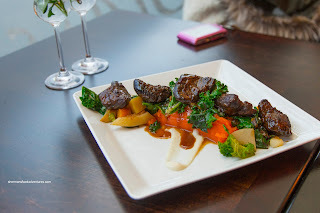 Seeing how it would be a good idea for a new blog post, I invited Emily to join me for a complete meal to compliment the Truffled Poutine entry in the challenge. To take advantage of natural light, we ate super-early at 4:00pm. 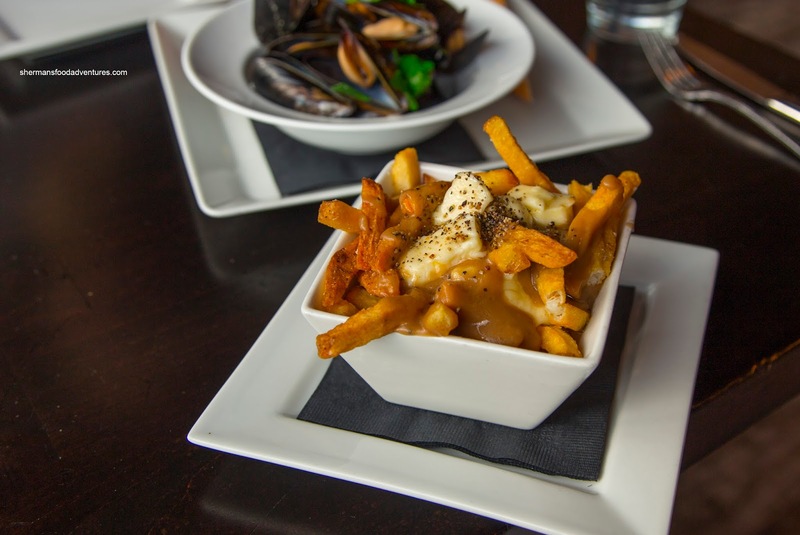 Getting right to it, we dug into the aforementioned Truffled Poutine with Kennebec frites, cheese curds, chicken gravy and truffle oil. The base of the poutine, being the frites, were excellent. they were crispy without losing any soft potatoness. They held up well to the ample gravy which was thick, rich and purposefully seasoned. In big chunks and retaining a wonderful squeakiness, the cheese curds were plentiful from top-to-bottom. The only thing we would've changed was the amount of truffle oil. It was appealingly Earthy, but there was too much of it. Up next, we had a small portion of the Steak Tartare. 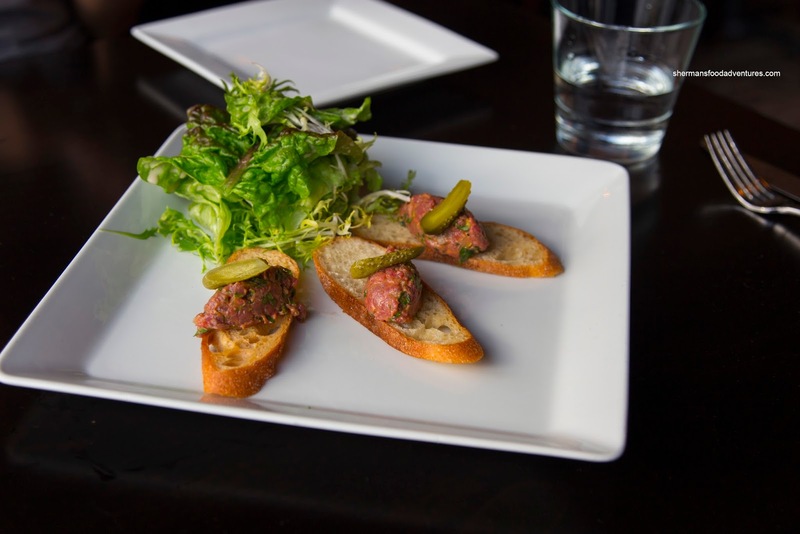 It was made with beef tenderloin served on crostinis and accompanied by mixed greens. Although the steak was fresh and visually appealing, there were some chewy portions including a piece of sinew. It was still relatively tender and was seasoned nicely with hits of mustard and shallots. I thought the amount of acidity was perfect as it kept the flavours bright. We also ordered the 1/2 lb. 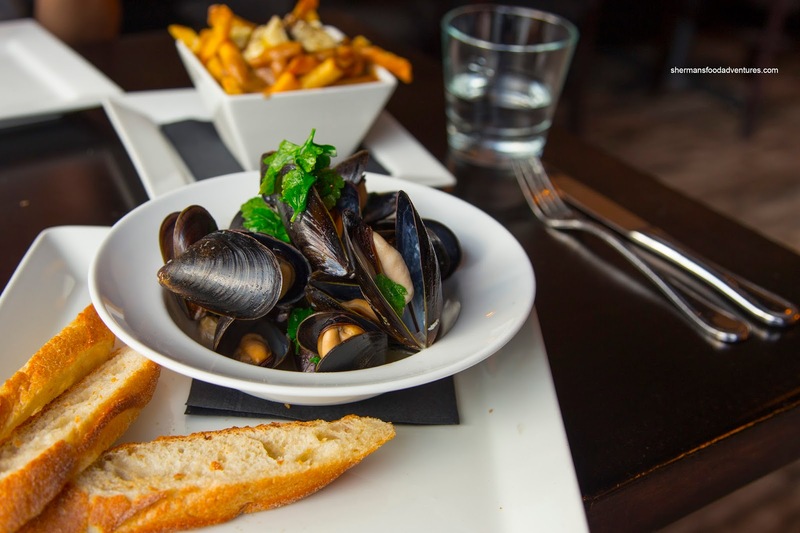 of Moules Mariniéres prepared in a broth consisting of shallots, confit garlic and herbs in white wine. Cooked beautifully and being relatively plump and buttery, the mussels were the beneficiary of a tasty briny broth. It had the aromatics thanks to the shallots and garlic while the wine was cooked down properly. It was also well-seasoned without being reliant on salt. Even the crusty baguette was outstanding. 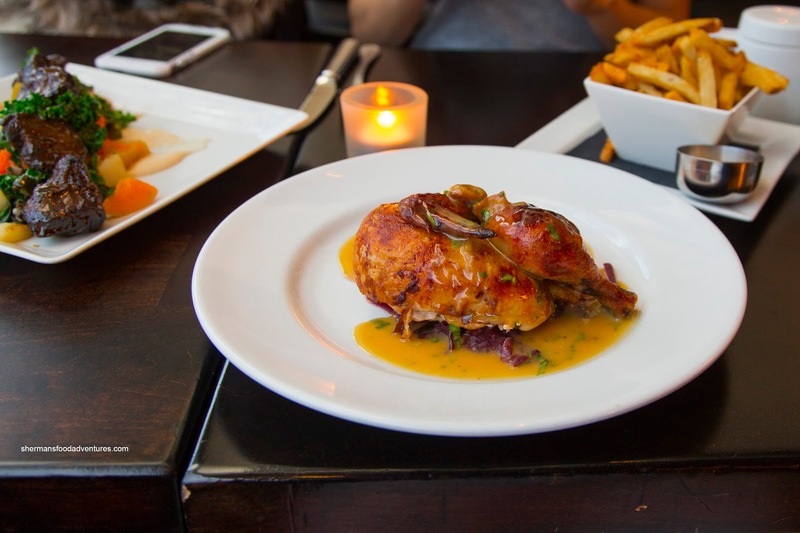 For our mains, we were recommended the Beer Brined Rotisserie Chicken. Normally, we don't order chicken since there are more interesting items on most menus. However, this was a solid choice. Thanks to the flavourful brine and expert execution, the chicken was tender and juicy (even the breast meat). Sporting a fully-rendered and aesthetically-appealing skin, the chicken was further enhanced by the smooth and mildly seasoned confit garlic jus and red cabbage (not sure if this matched the chicken though). A side of their fabulous frites was included. The last plate of food was also the best being the Lamb Cheeks with carrot & German potato mash, local seasonal vegetables and lamb jus. Each piece of cheek was tender, gelatinous and full-flavoured from the braise. With just the right amount of silky lamb jus, there was enough depth-of-flavour without watering down the plate. The rest of the root veggies and the kale were prepared perfectly while the mash was sweet, savoury and smooth. 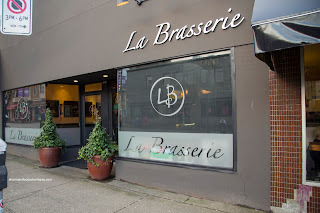 So despite the change in ownership and over 6 years in between visits, La Brasserie still remains a tasty option on Davie.